November 5, 2016 , our 2nd event in Louisiana, marked the official opening of our first charter in the Gulf South. This is a big step for GIG as we continue to expand across the country bringing the females of the mats together. The event featured four hosts representing schools from Louisiana and Mississippi: Jessica Webb from NOLA BJJ, Jessica Guedry from BJJ Revolution, Jessica Catherine Dobbs from No Limit Jiu Jitsu, and Monica Champagne from Gracie Lafayette Team Hopkins Jiu Jitsu. Sixty females from as young as 5 years old from 19 different academies in Florida, Louisiana, and Mississippi came together is solidarity to celebrate the Girls in Gis Louisiana Chapter grand opening. The event kicked off with an opening reception lead by Girls in Gis ambassador Shama Ko and newly appointed ambassador for the Girls in Gis Louisiana chapter Caroline Vanek. Shortly after was a fun warm up that got the group moving and filled the room with laughter. After the warm up the girls were broken up by skill level in to two groups. Jessica Webb and Monica Champagne worked with beginners and Jessica Catherine Dobbs and Jessica Guedry worked with a more advanced group. Jessica Webb paired up with Monica Champagne working with one group on a transition from standing guard break to bull fighter pass and over/under pass. Monica showed arm bar attacks from mount position and how to transition to bow and arrow choke. She also demonstrated how to transition from quarter guard to north-south with a kimura grip and how to get the arm bar if the kimura is blocked. Jessica Catherine Dobbs and Jessica Guedry worked with a more advanced group of females. Jessica Guedry demonstrated reverse Kesa Gatame pass, reverse Kesa Gatame rolling back attack, and defense to reverse Kesa Gatame pass. Congratulations to Lisa Litrell and Elisabeth Stanicoff of NOLA BJJ for showing off their airplane skills and winning the airplane challenge. 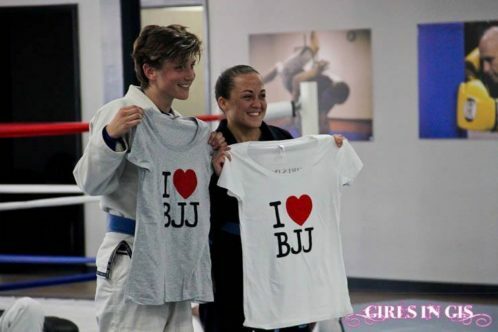 Wear you Girls in Gis shirts with pride!. 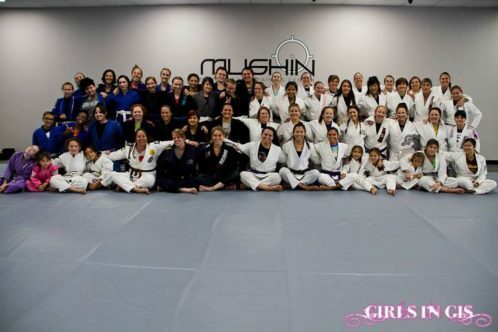 Girls in Gis is grateful to all of our hosts and to Mushin Training Center for giving us the opportunity to use their beautiful facility to keep spreading the Girls in Gis mission to empower and unite females on and off the mats. Thank you to our photographer Wesley Cheek for capturing all of the memories. We look forward to the many more events in the Louisiana area.